Mealtime is an event at Hilton Sandestin Beach. With multiple, on-site dining venues, we have plenty of options for even the pickiest of eaters. From our breakfast buffet at Sandcastles, to our beachside market, sushi bar, late night comfort food and more — there are plenty of options to please your palate at our Gulf Coast restaurants. But mealtime isn’t all about what’s on your plate — it’s also about what’s in your glass. Our Sandestin restaurants all feature delicious wines, cravable cocktails and refreshing brews to sip alongside your meal. Below, some of our favorite beverage and meal pairings across the resort. Nothing says vacation quite like a leisurely breakfast. 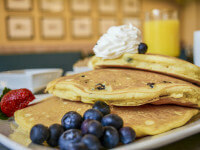 Sandcastles Restaurant at Hilton Sandestin Beach has one of the best breakfast offerings on the Gulf Coast. 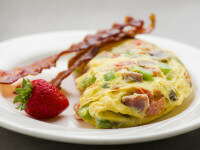 The restaurant offers a full breakfast buffet or delicious made to order items. One of our favorites is the Gulf Coast Benedict, which features sauteed lump crab meat. This local specialty is best enjoyed with a refreshing mimosa. For a virgin option, go for the fresh squeezed orange juice on it’s own. We promise it won’t disappoint! 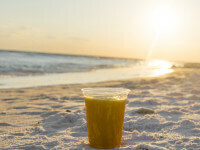 When lunch time rolls around, you may not want to leave the beach to forage for food. And luckily, you don’t have to! 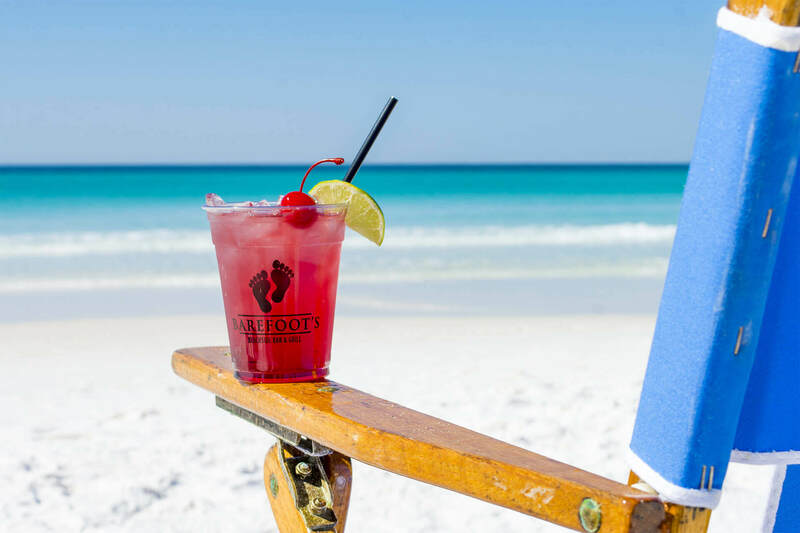 Barefoot’s Beachside Bar & Grill is one of the most conveniently located restaurants on the Gulf Coast — sitting right on our pool deck, just steps from the beach. During the summer you can even order meals directly to your beach chair using your mobile device. For a beachside lunch, we recommend the Grilled Fish Tacos and a refreshing Grayton Beer Company beer. Brewed in South Walton, Grayton Beer Company beers are favorites among locals — and the perfect complement to a grilled Gulf fish dish. Still hungry come mid-afternoon? 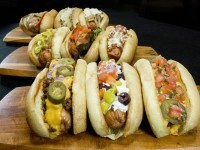 Stop by Picnix Poolside Market for one of our famous hot dogs. Some options include the Buffalo Dog with buffalo sauce, blue cheese crumbles and dressing, shredded carrot and celery, or a Southern Dog with coleslaw, onions, and BBQ sauce. No matter which dog you choose, make sure you pair with a refreshing frozen beverage from Barefoot’s Beachside Bar & Grill — like our local classic, the Bushwacker. It’s the ultimate summer indulgence, with rum, ice cream, mocha, and crème de Cacao. While at Hilton Sandestin Beach, guests must experience the magic of Seagar’s Prime Steaks & Seafood. It’s the only Gulf Coast steakhouse with a AAA Four-Diamond designation and serves up the most delicious prime USDA steaks and delightful seafood. Try the filet mignon paired with a Pinot Noir from this Sandestin restaurant’s award winning wine list. The list has repeatedly garnered Wine Spectator's "Best of Award of Excellence" and includes delicious Pinot Noirs (like Meiomi, Belle Gloss and Baracchi) from all over the world. Sandcastles Lounge is open late, and features a menu of lounge fare to nibble on while you chat with friends or watch a sporting event on the lounge’s big screen TV. For either agenda, order some delicious wings (served mild or hot) and sample featured bourbons or whiskeys with a flight. Each flight includes four options of your choice from our selection of nationally recognized and loved brands. At Hilton Sandestin Beach, guests are able to sample some of the finest Gulf Coast restaurants without ever leaving the property. During your stay at Hilton, make sure to amp up your mealtime with a delicious beverage to complement your food. Picky Eater? Adventurous Palate? Meal Suggestions for All.